As a legend, it can still serve as an illuminating model. Fictional Caligula made his horse a consul. President Donald Trump is also clearly a work of dystopian fiction in progress, and the episode entitled “The Nomination of Brett Kavanaugh” is curiously parallel to Incitatus. – large credit card debts, possibly related to gambling, and their unexplained cancellation by parties unknown. That’s independently of the normal questions over his professional career, especially his work at the Bush White House, on which proper documentation was blocked, and his judicial decisions and philosophy. It’s quite a list. Recall that no similar charges of personal sleaze were laid against the previous SCOTUS nominees Merrick Garland and Neil Gorsuch, nor the reputed reserve candidate Amy Barrett. A: Brett Kavanaugh is the victim of a coordinated progressive smear campaign whose only precedent is the conservative one against the Clintons, in which Kavanaugh was an active player. B: Brett Kavanaugh is a man of low moral character with a variety of questionable habits and skeletons in his cupboard. The first is not plausible. If you were Chief Smearer, would you give the publicity-seeker Michael Avenatti a part? Would you bother at all with Deborah Ramirez’ exposure allegation? It all looks chaotic and uncoordinated. So I’ll go with low moral character. Which brings us to Incitatus. The legendary “Caligula”’s purpose in appointing him would have been to humiliate the Roman Senate and serve as a loyalty test of its scared surviving members. That fits Trump. His view of life is Manichaean: negotiation is a zero-sum game, with a gloating winner and a humiliated loser. Trump may have chosen Kavanaugh out of the long list supplied by the Federalist Society precisely because Kavanaugh is sleazy and unfit for the office. No wonder McConnell was reportedly opposed to the choice, and his fears are being proved right. Coda: the rival theory for the bizarre choice is that while there are plenty of reactionary judges who are pro-business and anti-abortion, the same is not true on executive immunity. Few movement conservatives go with l’Etat c’est moi (another powerful false legend). Only Kavanaugh ticked all the boxes. This may well be part of the explanation, but Kavanaugh’s views on this are so extreme as likely not to be very influential in SCOTUS. Image credit: Wikimedia. It’s a copy in the Campodoglio square in Rome of an equestrian statue of the upright Marcus Aurelius, the Barack Obama among the emperors. Yes we all know about crazy Roman Emperor Gaius Caligula and his horse. Thanks for sharing source of the story through this article. Kavanaugh is a piece of Trump’s campaign to delegitimize the government generally, creating a power vacuum for him to fill by himself. It’s working well so far. Actually, Suetonius does mention Incitatus, and the possibility, but not the certainty, that Incitatus might have been named consul. I can’t agree that the man currently acting as US president is trying to stick it to the Senate. He is simply trying to please a disturbing group of people who give him adoration, in the belief that they will give him more adoration, something he has a constant, desperate need for. So Suetonius (not one to miss a good story) is even vaguer and less committal than Dio Cassius on the consulship. 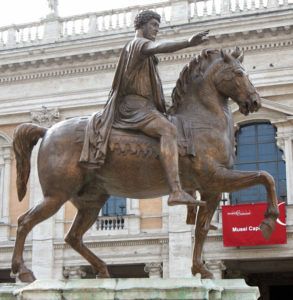 Great source of content on crazy Roman Emperor Gaius Caligula and his horse. Happy to read such an excellent story. Thanks for sharing it with us.